SWATTING is the act of sending a SWAT team or some type of law enforcement response to a location by convincing law enforcement that an incident has occurred or is about to occur that requires immediate law enforcement response. 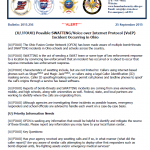 Characteristics of swatting include, but are not limited to: Callers using internet-based phones such as Skype USBUS and Magic Jack USBUS, or callers using a legal Caller Identification (ID) masking service. Caller ID spoofing/masking services permit cell phones and landline phones to spoof the call’s origins through a service fee based software. Reports of bomb-threats and SWATTING incidents are coming from area elementary, middle, and high schools, along with universities as well. Federal, state, and local partners are working to identify where the calls are originating from. The Ohio State Highway Patrol Criminal Intelligence Unit recently partnered with the Ohio Strategic Analysis and Information Center (SAIC) and gathered information regarding bath salts via a survey. The objective of the study was to assist Law Enforcement by creating an officer safety awareness product relating to the dangers of encountering people on bath salts. (U//FOUO) During periods of colder weather, Ohio citizens and law enforcement officers (LEO) encounter a variety of winter clothing—ski masks, toboggan hats, stocking caps, scarves, head bands, hooded sweatshirts, and heavy coats—that can present challenges to identifying individuals in public areas and public transportation. (U//FOUO) This bulletin provides information on a growing trend involving the use of an herb-based product similar to marijuana known as “Spice”, or “K2”. The product is being used to get high and it is legal to purchase. Recently a new way to commit suicide has been discovered by mixing two chemicals that can be bought over the counter at local stores. They are Bonide, a sulfur spray used as an insecticide for fruit trees, and hydrochloric (muriatic) acid. Once mixed, the chemicals produce heat and a flammable, noxious gas that causes the subject to pass out and the heart to stop within minutes. The process appears to be quick and painless. Two documented cases, one in Pasadena, California and the other at Lake Allatoona in Bartow County, Georgia, involved young men in their early 20s. Both were found locked inside their cars with the chemicals. Each left a note on the car warning anyone around of danger. The car at Lake Allatoona had been taped to prevent gas from escaping. The Ohio Hospital Association (OHA) Regional Hospital Evacuation and Mass Fatality 2009 TTX is sponsored by The Ohio Hospital Association and the Ohio Department of Health with funding support from the Health Services and Resources Administration, U.S. Department of Health and Human Services, Catalog of Federal Domestic Assistance (CFDA) Number 93.889. One of the entries indicates nuclear secrets black market, and it says,”Edmonds alleges that in the course of her work for the government she found evidence that the FBI, State Department and Pentagon had been infiltrated by a Turkish and Israeli run intelligence network that paid high ranking American officials to steal nuclear weapons secrets,” and they have some footnotes for that, some cites. Is that correct that you’ve made those allegations?